DPA are credited as being the first mic manufacturer to bring full studio quality microphone sound to the live performance arena. Sting is one of the many top-tier artists that use DPA d:facto condenser microphones in their live performances. Royal Blood, the English duo who topped the UK charts with their self titled debut album in 2014 also use this mic for live vocals as well as other DPA mics for instruments. It features a 3 stage pop filter and a high-pass filter at 80Hz. 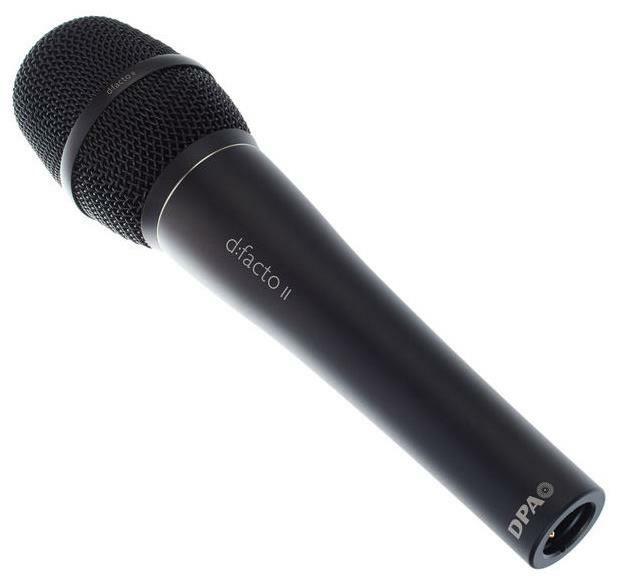 The stand-out feature of the DPA d:facto II is that it has a modular design which allows the capsule to be removed, and with the help of adapters from DPA, inserted into other company's wireless systems which can save you up to 75% of the cost of buying a wireless version - it's compatible with Lectrosonics, Sennheiser, Shure and Sony wireless systems. Expert reviews praised this for its clear and uncolored sound, its warm bottom end without being boomy, and the quality of the build. The fact that you can get adapters to insert the capsule into other wireless mics was also rated as a huge positive. Very few reviewers had anything negative to say other than commenting on the high price. If you need a high-end live mic which you can also use in the studio, and you can make use of the ability to drop the capsule into other wireless systems, then this is the best your option. If you want to see what the top rated live vocal mics are that are currently available new then please read our guide: The Best Live Vocal Mics.